After Amazon CEO Jeff Bezos revealed that the National Enquirer tried to blackmail him, and accused Donald Trump and Saudi Arabia of being in on it, the SDNY let it be known that it’s criminally investigating the matter. There’s reason to believe that the SDNY, thanks to its ally Robert Mueller, may already have what it needs to tie Trump and Saudi Arabia into it. After he published his story, Jeff Bezos then told a Washington Post reporter that he suspects a “government entity” may have gotten into his cellphone in order to gain blackmail material, as opposed to some private hacker. So what’s a government entity? 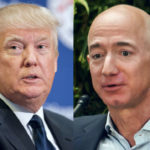 Did Trump find a rogue element at the NSA willing to wiretap Bezos? Or is Bezos referring to the government of Saudi Arabia? There’s already some intriguing evidence in play to support the latter. Back in June of 2017, the Huffington Post revealed that Michael Flynn helped facilitate the sale of cellphone spyware to a handful of corrupt governments who wanted to eavesdrop on their own political dissidents. One of the nations on that list is – you guessed it – Saudi Arabia. Six months after this report, Flynn cut a cooperating plea deal and promised to tell Robert Mueller everything he knew about every criminal scheme he’s ever participated in. Mueller recently confirmed in court filings that Flynn was indeed 100% cooperative. If the government of Saudi Arabia did indeed purchase spyware designed to take over cellphones, with the intent of using it to target political enemies, it would give them motive and opportunity to get into Jeff Bezos’ phone. If Michael Flynn was indeed in on this scheme, then he’s already told Robert Mueller all about it. And we know that Mueller shares everything relevant with SDNY. In addition, Michael Flynn’s involvement in Saudi Arabia’s political spyware scheme would help tie the hacking of Jeff Bezos back to Donald Trump, as it appears Flynn was doing this work in the same timeframe in which he was a Trump 2016 campaign adviser. In other words, with all these criminal connections, and Trump’s overall status as a financial puppet of Saudi Arabia, are we supposed to believe Trump somehow wasn’t involved in it all?